White House chief economic adviser Larry Kudlow calls for a "timeout" as he talks to reporters outside the White House, April 6, 2018, in Washington. U.S. President Donald Trump and his administration said Friday that the United States was not engaged in a trade war with China, even as Trump threatened to impose tariffs on an additional $100 billion worth of Chinese goods and Beijing warned it was willing to fight back. “This is just a proposed idea, which will be vetted by USTR [the U.S. trade representative], and then open for public comment, so nothing has happened, nothing has been executed,” said White House chief economic adviser Larry Kudlow amid growing concerns about escalating rhetoric between Washington and Beijing. U.S. President Donald Trump and China's President Xi Jinping meet business leaders at the Great Hall of the People in Beijing, Nov. 9, 2017. The White House blamed China for trade practices it said were illegal and unfair. “China created this problem, and the president is trying to put pressure on them to fix this, and take back some of the terrible actions that they’ve had in the last several decades,” said White House press secretary Sarah Huckabee Sanders during a briefing on Friday. The U.S. and China are in routine contact, but “this is a negotiation period, that’s why it doesn’t happen immediately, and there’s a process, and we’re going through that process,” said Sanders. Chinese Ministry of Commerce spokesman Gao Feng gestures as journalists raise hands for questions during a press conference at the Ministry of Commerce in Beijing, April 6, 2018. Meanwhile, Beijing showed no intention of backing down. “China is already fully prepared. If the United States announces an additional $100 billion list of tariffs, we will not hesitate to immediately make a fierce counterstrike. 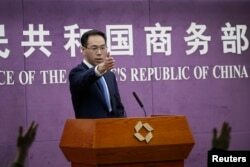 We are not ruling out any options,” said China’s Commerce Ministry spokesman, Gao Feng. “Under these conditions, it’s even more impossible for both sides to conduct any negotiations on this issue,” Gao added. On Thursday, Trump announced he had instructed the U.S. trade representative to consider whether tariffs on another $100 billion of Chinese goods would be appropriate after China issued a list of U.S. goods, including soybeans and small aircraft, worth $50 billion for possible tariff hikes. The United States had proposed tariffs on $50 billion worth of Chinese goods earlier this week. Last month, after a monthslong investigation under Section 301 of the Trade Act of 1974, the U.S. trade representative determined that China had repeatedly engaged in unfair trade practices to obtain America’s intellectual property and pressure technology transfer from U.S. companies to Chinese entities. Julian Evans-Pritchard, senior China economist at Capital Economics, told VOA it was unclear when and whether the threatened tariffs would be imposed. “It seems likely the tariffs are being used as a negotiating tactic to try to get concessions from the Chinese side in terms of market access for U.S. firms and protection of its intellectual property, so there’s still a possibility that these tariffs will never come into force,” he noted. While it was not a surprising the White House pushed back against China’s retaliatory threats, some experts were surprised by how swiftly it did, according to Riley Walters, Asia economy and technology policy analyst at the Heritage Foundation. Walters cautioned it was a risky move to use tariff threats as a negotiating tactic because it can affect lives and income of Americans. 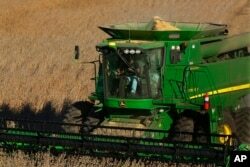 FILE - A farmer uses a combine to harvest his soybean field Oct. 21, 2014, in Loami, Ill.
​If the tariffs go into effect, “what it could mean is both increasing cost for American consumers, but also an uncompetitive edge for American exporters to China. If you are a soybean producer, and if your goods go up 25 percent in China, then you are less price competitive than other exporters to China of soybeans,” Walters said. Walters expects more rhetoric between the White House and China in the coming weeks. Evans-Pritchard predicted that if the USTR published another list of goods worth $100 billion to be subjected to tariffs, China would respond with the same measures. “Once we started talking about $150 billion — which would be what’s on the cards, given the $50 billion existing tariffs plus $100 billion proposed — basically that is all of China's goods imported from the U.S. So it will start looking elsewhere to retaliate,” Evans-Pritchard said. This story was written by VOA’s Peggy Chang. Jingxun Li of VOA's Mandarin service contributed to this report.